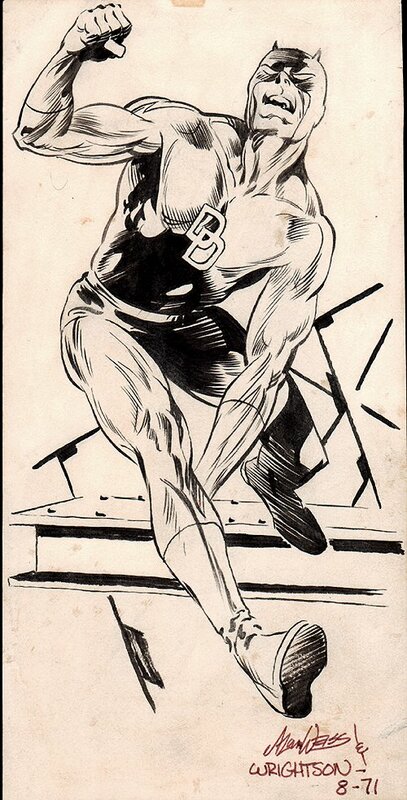 an interesting original drawing here penciled by Alan Weiss and inked beautifully by Bernie Wrightson in 1971 of Daredevil. This illustration was published in an issue of ROCKET'S BLAST COMIC COLLECTOR sometime during the early 1970's. This art is drawn with brush and ink on cut out art board and signed and dated by both artists, and dated "8-71." Bernie's inks are beautifully rendered on this unusual collaboration between two artists who at this time period had a close friendship while working in New York City. The image area measures 4 by 8 inches, and looks great! This may have been the only time these two artists worked on Daredevil. ALL art on our website (including this one) are able to be purchased with VERY fair time payments, and trades are always considered towards "ANY" art on our website! Just send us an email to mikeburkey@aol.com and we can try to work something out.